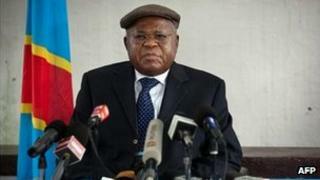 Police in the Democratic Republic of Congo have fired tear gas to disperse supporters of the opposition leader, Etienne Tshisekedi, in the capital, Kinshasa. Mr Tshisekedi was urging his supporters to accompany him to the presidential palace. He declared himself president after refusing to accept last year's elections results. A BBC correspondent says Mr Tshisekedi was prevented from leaving his home. Incumbent Joseph Kabila was declared the winner in November's elections, but Mr Tshisekedi says he was a victim of fraud - and duly held his own 'swearing-in' process. On Thursday, he and his Union for Democracy and Social Progress (UDPS) supporters tried to march to the president's office so he could take up his "active functions". They were blocked by police - who shut down several streets in the Limete district of Kinshasa where the veteran opposition leader lives and used tear gas on the UDPS supporters who turned up to make the journey to the presidential palace. The BBC's Thomas Hubert in Kinshasa says that police also barred access to journalists and briefly detained reporters from the AFP news agency. Our correspondent says it appears as if Mr Tshisekedi is under unofficial house arrest. Last November's elections were the first Congolese-organised polls since the end of a devastating war in 2003, which left some four million people dead. The poll was heavily criticised by foreign observers, the opposition and Catholic bishops - who complained in a statement of "treachery, lies and terror" and called on the election commission to correct "serious errors".